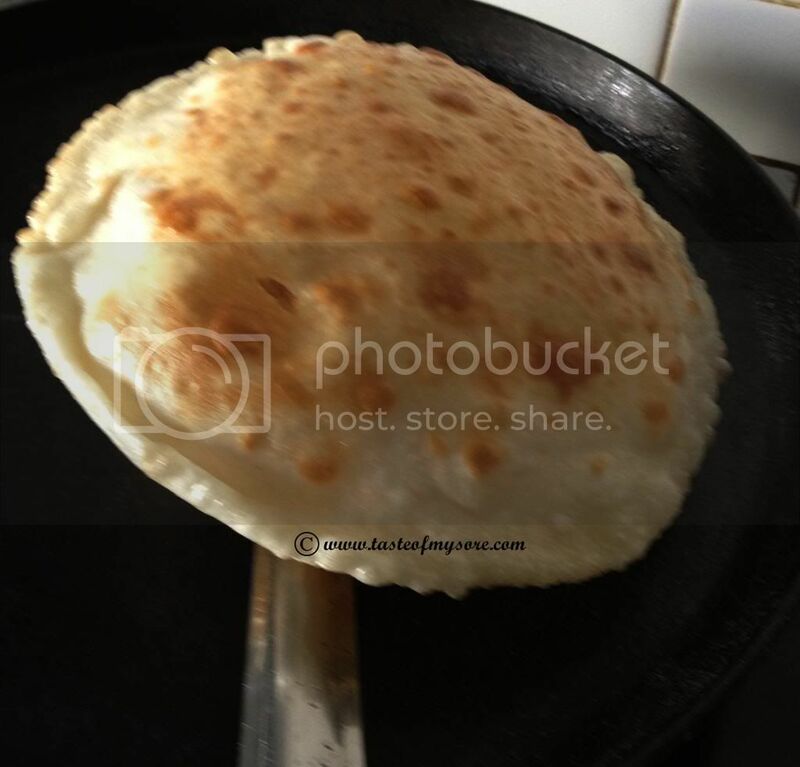 This post is definitely good for some tips on frying Bhatura which can be extended to pooris as well. Do take a peek! 1. In a deep bowl measure and add sugar, salt, yogurt, plain flour and yeast. Add ingredients in the same order mentioned. It makes some difference when added in different sequence, esp Yeast. 2. Mix all the ingredients. Add more water if you need to make a firm dough. 3. Allow the dough to rest. Cover the dough with damp cloth. The resting time is 1-2hr in a warm place. At the end of 2hrs, you can see the dough rising. 5. 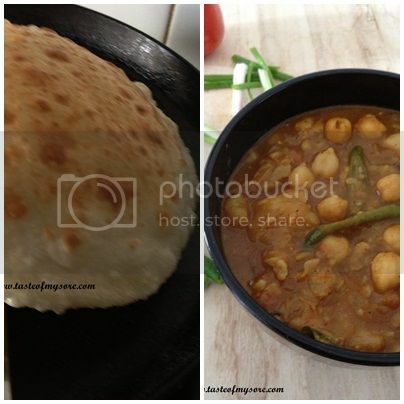 Heat chapathi pan (flat pan) and frying pan with oil. Roll out the dough to make a circle. Transfer this rolled out dough to chapathi pan. Fry this for few seconds on both the sides. 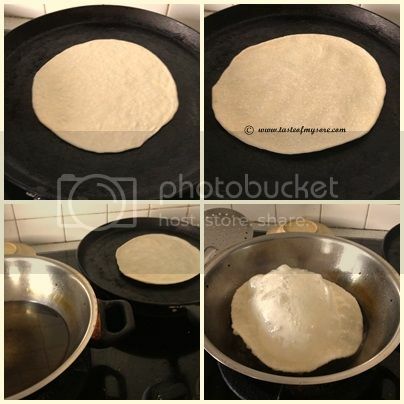 Slide this half baked chapathi into hot oil to have instantly puffed up Bhatura. 6. You can use the same technique to fry pooris. 7. Why this extra step? According to my observation, this extra step has reduced the oil required for frying Bhatura and Pooris. The oil does not get dirty with the dusting powder and it instantly puffs up without having to wait for long time. I absolutely loved this trick which was suggested by Tarla Dalal on one of her cookery shows. Thank you Tarla ji for this tip. 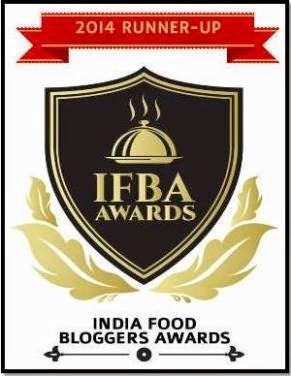 As mentioned above, this post is definitely good for tips on frying Bhaturas. These tips are tried and tested in my kitchen and even extended to Pooris as well. They work well for both. Serve these Bhaturas with Chole, Spring onions and few slices of lemon. Awesome, awesome bhaturas. That was a good tip in half baking in the tawa before deep fry, will do this way next time. Please check my blog for tasty cup cake with cream cheese frosting. Nice idea, I think since water evaporates on tava - it reduces the thickness of batura and absorbs less oil. Thanks for the tip LG! Next time poori maduvaga I'll try making it this way. Wish i live near you to enjoy this beautiful bhatura,tempting..